Fr. John Romanides has written that the true history of Western civilization begins with the American and French Revolutions. It was during this late 18th century atmosphere of revolution that the use of the terms "conservative" and "liberal" were first used in a political context. François-René de Chateaubriand in 1819 first used the word "conservative" this way following the French Revolution. The term, historically associated with right-wing politics, has since been used to describe a wide range of views. Conservatism developed in Restoration England from royalism. Royalists supported absolute monarchy, arguing that the sovereign governed by divine right. They opposed the theory that sovereignty derived from the people, the authority of parliament and freedom of religion. The French Revolution is often seen as marking the "dawn of the modern era," and its convulsions are widely associated with "the triumph of liberalism". The early liberal thinker John Locke, who is often credited for the creation of liberalism as a distinct philosophical tradition, employed the concept of natural rights and the social contract to argue that the rule of law should replace absolutism in government, that rulers were subject to the consent of the governed, and that private individuals had a fundamental right to life, liberty, and property. Napoleon wrote that "the peoples of Germany, as of France, Italy and Spain, want equality and liberal ideas," with some historians suggesting that he may have been the first person ever to use the word liberal in a political sense. Ambrose Bierce defines politics in The Devil's Dictionary as "a strife of interests masquerading as a contest of principles. The conduct of public affairs for private advantage." Though there is much truth to this, essentially both conservatism and liberalism contain certain virtues that ought to be considered. Neither conservatives nor liberals are evil in themselves, but division is evil and opportunism is evil and selfishness is evil. Differences in self-interest are what form modern politics, setting aside the essential virtues behind both the conservative and progressive spirit. The Christian ought to be above these secular ideas of modern politics and be firmly established in the Christian tradition, which is both traditional and progressive in a sense above those formed by secular politics. Neither conservatives nor liberals are the unqualified partisans of freedom. Both groups believe in a certain kind of freedom. What really distinguishes conservatives from liberals is not that one is for freedom and the other is against freedom; rather, what separates them is that they have different substantive views of what constitutes the good life. There is some overlap in the moral vocabulary that liberals and conservatives use. Both speak of “equality,” although they mean different things by the term. Conservatives emphasize equality of rights, and they are quite willing to endure inequalities that are the product of differential capacity or merit. Liberals emphasize equality of outcomes, and they tend to attribute inequality to the unequal opportunities that have been provided by society. Another term that both liberals and conservatives use is “morality,” but conservatives tend to define morality personally, while liberals define it socially. Conservatives find it hard to believe that a sexual reprobate could be a good person, but many liberals who acknowledged Bill Clinton’s personal failings nevertheless considered him an admirable person because of his public positions in favor of the poor and women’s rights. Since conservatives and liberals have different conceptions of the good society, their priorities are different, and this leads to contrasting policy positions. 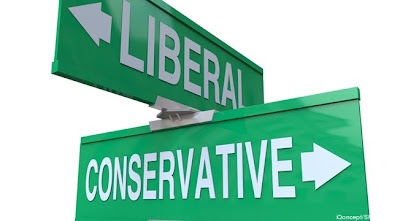 Conservatives emphasize economic growth, while liberals emphasize economic redistribution. Conservatives like to proclaim their love of country, while liberals like to proclaim their love of humanity. Conservatives insist that force is required to maintain world order, while liberals prefer the pursuit of peace through negotiation and dialogue. Conservatives are eager to preserve moral standards; liberals cherish personal autonomy. Conservatives recognize that there are two principles in human nature—good and evil—and these are in constant conflict. Given the warped timber of humanity, conservatives seek a social structure that helps to bring out the best in human nature and suppress man’s lower or base impulses. Conservatives support capitalism because it is a way of steering our natural pursuit of self-interest toward the material betterment of society at large. Conservatives insist that there are evil regimes and destructive forces in the world that cannot be talked out of their nefarious objectives; force is an indispensable element of international relations. Finally conservatives support autonomy when it is attached to personal responsibility—when people are held accountable for their actions—but they also believe in the indispensability of moral incubators (the family, the church, civic institutions) that are aimed at instructing people to choose virtue over vice.